"Pelmeni are traditional Russian meat-filled dumplings. Making pelmeni is favorite family pastime in the long winter months. These dumplings are a common convenience food - big batches can be frozen and quickly boiled or fried on demand." Combine egg, vegetable oil, and salt in a measuring cup; add enough water to fill to 1 cup. Pour into a bowl, add 3 cups flour, and knead into a smooth, elastic dough. Cover with a kitchen towel and rest for 30 minutes. Dust a baking sheet lightly with 1 tablespoon flour. Combine ground beef, onion, water, salt, and pepper in a bowl and mix filling thoroughly by hand or using a fork. Roll out a portion of the dough very thinly on a lightly floured surface and cut out 2 1/2-inch rounds with a cookie cutter or a wine glass. Keep the rest of the dough covered with a towel to avoid drying out. Place 1/2 to 1 teaspoon of filling on one side of the dough circle. Fold dough over and seal the edges using fingers, forming a crescent. Join the ends and pinch them together. Place on the prepared baking sheet. Repeat with remaining dough and filling. Freeze pelmeni for 30 minutes to prevent them from sticking together. Bring a large pot of lightly salted water to a simmer and drop small batches of frozen pelmeni into simmering water. Cook and stir until the meat is cooked and pelmeni float to the top, about 5 minutes. Continue cooking for an additional 5 minutes. Transfer to serving plates using a slotted spoon. Instead of ground beef you can also use a mixture of half ground pork and half ground beef. Sometimes we use ground turkey for the filling. If you're not a fan of raw onion, saute onion in butter first for 5 to 7 minutes on medium heat. You can also make the dough in a Kitchen Aid®, just turn it off once the dough is forming a ball. The meat filling can also be made by processing filling ingredients through a meat grinder but do not use a blender or food processor, unless you have a special setting for meat. In Russia, people often use a pelmeni mold for forming pelmeni. If you have a pelmeni mold, roll out portions of the dough very thinly on a slightly floured surface. You should end up with a circle slightly bigger than the mold. Place rolled out dough onto the mold with the floured side down (the "sticky" side should be facing you). Place a little ball of filling (about 1 teaspoon) into every cell. Cover with another dough layer and sprinkle with flour on top. Roll with a rolling pin over the top, until pelmeni start "popping out" from the mold. Gather the remains of the dough, add a little bit of new dough to it, and roll out again, repeating the process until all the dough is used up. Pelmeni can also be fried in a skillet. Melt butter or bacon grease in a skillet and saute frozen pelmeni until they are soft and the meat is cooked through, just like pierogi. 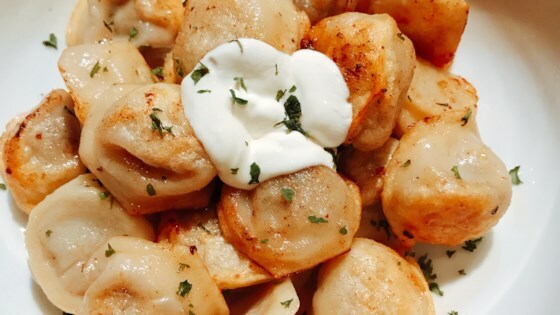 Pelmeni are usually served with sour cream or vinegar. In our house we usually double this recipe and fold about 200 pieces. Leftover pelmeni can easily be frozen for later use. I used deer instead of beef and it still tastes good. Delicious pelmeni recipe.. so happy to make my own since the nearest Russian store is 50 miles away. These were amazing! An instant classic at our house!